Dictionaries: "They are the nasty medicine which you are handed when you display even the slightest ignorance about the meaning of a word." Or so we thought. College professors and high school English teachers know the vice well -- the dreaded dictionary definition hook that slumps atop the introduction of their students' hastily written persuasive essays. "According to the Oxford English Dictionary," they start out, "the word 'democracy' (or any other fearfully overanalyzed topic) is defined as a government by the people." After all, if the Oxford English Dictionary says it, it must be true. Or at the very least, it comes from a credible source. These students have John Simpson to thank. Long before college freshmen began defining their terms as noted above as a way of giving their ideas some scholarly clout, lexicographers like Simpson pored over words and their definitions, hoping to transmit the most accurate representation of their meanings, pronunciations, and origins. Today, the Oxford English Dictionary (OED) inhabits its online territory with the same authority, comprehensiveness, and academic respectability it has garnered since the publication of its complete first edition in 1928. Simpson -- who began his career in 1976 by helping to publish the official Supplements to the first edition -- offers readers glimpses into the process of modernizing the dictionary. Massive filing cabinets and stacks of index cards turned into CD-ROMs and computers; timid definitions of four letter words grew bolder, which paved the way for current debates over words like selfie and 101 (which is considered a word, thanks to the American college course system). Most of all, however, Simpson helped bring the Dictionary out of the cloistered haunts of Oxford dons and intellectuals, and into the hands of the masses (whence came the college freshmen and high school students). The great democratization of the OED sheds light on the role and the work of the lexicographer. As Simpson pithily states before narrating the events leading up to his employment, "Nobody thinks dictionaries are written." God bless the souls who read dictionaries, the general attitude goes, and god help the souls who write them. On one end, lexicographers must grapple with misconceptions about the supposed tedium of writing dictionary entries, and on the other end fend off linguists and manqué novelists who sigh for the Oxonian glamor of molding the English language. Simpson adamantly refutes both these ideas: historical dictionary work can in fact be fun and exciting, and as for anyone who wishes to apply for a lexicographical position at the OED, he will have it known that self-proclaimed "lovers of words" are not welcome. Lexicographers, he says, are historical word detectives, and the job requires stamina, patience, and a sharpened capacity for logical reasoning -- not inflated literary pretensions or a desire to work at Oxford. Similarly, the objective of the Dictionary is not to "hector" its readers, to use Simpson's term. Nor should it dictate or prescribe. On the contrary, the OED serves to memorialize the history of the English language and to describe its usages and permutations. More than just a list of definitions, the Dictionary reflects and records cultural changes, and lexicographers must sensitize themselves to these changes by observing, monitoring, and reporting on them as they occur. In other words, language is not meant to be guarded or frozen in time. As Simpson readily admits, however, Oxford University and its ancillary projects (such as the Press and the Dictionary) revel in nostalgia and exclusivity. Few people associate dictionaries (least of all the OED) with leisure, creativity, and inclusion, and for good reason. Before the advent of computers, the OED was "an intensely scholarly beast", a dinosaur that quoted Shakespeare and Milton and listed words that only its strait-laced keepers deemed proper. Those who consulted it did so in whispers, and entry to this elite club -- whether you were a student applying to university or a newly coined word vying for a spot on the page -- needed to be earned. By extension, the readers of the OED circa 1988 (many of whom contributed to the finding and defining of new words via their own research) responded in kind to this culture of scholarship and prestige. Simpson recounts: "It was curious, it seemed to me, that the collection of information about the language was conducted by 'readers' who belonged to the old world of literary, educated English. Language was an extension of empire for many of them." Attempts to stem the advancing tide of linguistic revolutions, alterations, and corruptions sprung forth from this glorification of the past and its reliance on "correct" meanings and "proper" usage. Eventually, the onslaught of technology helped lay those dusty attitudes to rest, and assisted Simpson in his crusade to make the Dictionary more reflective of the Anglophone world's diversity and vibrancy. Who does the OED serve, after all? Scholars? The university that created it? The global population of English speakers? Simpson remembers tracing the histories of 18th century Australian English coinages (e.g., boomerang and fossick), and comes to a savvy conclusion: "Language wasn't led by literary gods in those early years, but by ordinary people striving to gain a living in a hostile environment." If anything, Simpson owes his success as an editor to his understanding of the fact that words carry with them dynamic meanings that change alongside history. A word's meaning is rarely ever static, and for this reason the digitalization of the OED befits its purpose more than print supplements ever could (an ironic exception to the narrative that computers and gadgets result in the demise of the written word). Most of all however, Simpson recognizes the validity of all variants and dialects of the English language, which "was undergoing a process of globalisation rather than fragmentation." From aloo gobi to skanking, English was borrowing words from other languages and reinventing itself. If it was to survive, the Dictionary needed to follow suit. Simpson's memoir yokes all of these considerations into one pleasant and cohesive account of his career and personal life. He writes with easeful grace, employing a humorous and conversational tone saturated with characteristically British self-awareness. Additionally, Simpson packs his narration with explanatory asides and parenthetical insertions, and renders his memories with lighthearted charm, such as when he compares the interactions between the chief editor and the deputy chief editor in the '70s to Spock and Captain Kirk having "casual chats". Although the self-deprecating humor is excessive at times, for the most part Simpson's recollections sparkle with immediacy and relatability. 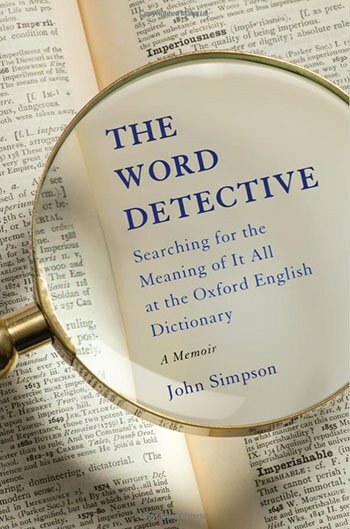 Unlike the executives at the Press or the Oxford dons with frightening credentials, Simpson retains his everyman sensibilities, and keeps the focus of the Dictionary and his memoir on what really matters: the words. This focus manifests itself in sections of bold text in which Simpson narrates the etymological twists and turns of a particular word used in the preceding paragraphs. By showcasing words like serendipity, aerobics, and bird-watching, Simpson intends to show that "any word can have an interesting history, if you just take a few moments to look behind the scenes." These little lexicographical interludes will delight any reader who enjoys accumulating tidbits of learning and trivia. Towards the middle and the end of the memoir they also provide a helpful respite from Simpson's narration, which can sometimes sound like a cross between a grandfather telling a story and a job candidate being interviewed. Furthermore, the transitions from accounts of Simpson's professional career to details of his family life tend to be awkward or nonexistent, even when he introduces a poignant passage about the tragic contrast between his daily involvement with words and his developmentally-disabled daughter's inability to speak. Finally, by the ninth or tenth chapter, Simpson's dramatic narration (e.g., "Finally, there was a chink of light") of the struggles that modernizing a dictionary entails becomes tiresome, if only because he has reiterated the exact sentiment since page one. Because he presents each development in chronological order, with no additional marker of importance, they all carry the same weight -- his employment, his promotions, his attempts to convince the Press for more time and funds. None of this impedes our enjoyment of the book, but it does raise the question, Who is Simpson writing for? If we consider the wealth of parenthetical insertions defining the usage of a sentence-adverb or explaining what the term Romance languages refers to, we can imagine his audience consisting of the uninvested curious, an amorphous mass of readers who enjoy cultivating knowledge but don't bog themselves down in gritty details. For them, The Word Detective would make a neat holiday gift. Those sympathetic to the OED's cause, as well as Simpson's reviled "lovers of words", will also find his divagations into the English language entertaining and stimulating. As for the young writers of subpar persuasive essays who ungratefully rely on Simpson's expertise, just knowing that the OED exists online for quick, easy use is enough for now.